DON’T WAIT! ACT NOW! ENTER THE BOW WOW BOO BUCKET TREAT GIVEAWAY! Happy Wordless Wednesday! Today we visualize 3 signs you might love Boxers. The dogs, not the pugilists. Hmm. I wonder if the Pug dog derives its name from pugilist? That face looks like it might have taken one too many punches. But let’s see the 3 signs you might love Boxers! 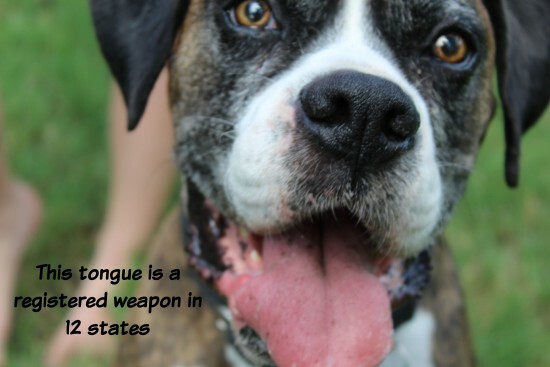 The Boxers I’ve met have long tongues, capable of either licking an intruder to death, or procuring treats from high shelves without your notice. You might love Boxers if that tongue, and all its slobber, makes you smile and want to kiss this dog on the nose. Believe it or not, not everyone loves a slobbering, tongue out dog. I know, right?!? 2. You Believe That They’re the Best Dogs. Period. I wasn’t going to come right out and say it, but Boxers really are the best dogs. I know you inferior dog people will argue with me, but save your breath and typing skills. Because that’s all you’ve got. Boxers are just the best dogs. Look at this face! How could you say otherwise?! Give this Boxer a Jones Natural Chew. Okay, so that’s the abridged list. But there aren’t very many more amazing dogs that are almost as good as Boxers and deserve the very best treats. Well, not that I can think of off the top of my head. On to number three! 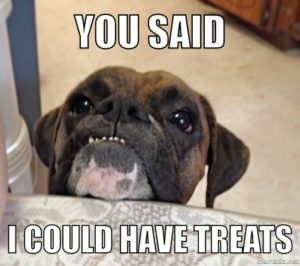 Boxers have begging skills second to no other dog. LOOK AT THIS FACE. You’re helpless against it. Why, even now, you find yourself wanting to reach through the screen and give this Boxer a treat. You can’t help yourself. I don’t know what the Boxer market is like right now. But if I were you, I’d be scouring Pet Finder and local rescues looking for a Boxer in need of a home. Thank goodness I’m not you. I already have four dogs. But you should definitely see about adopting a Boxer sometime soon. How could you not? That tongue! The fact that they’re the best dogs! And those begging eyes!! But once you have a Boxer, you’ll need the best treats, and you’re in luck! 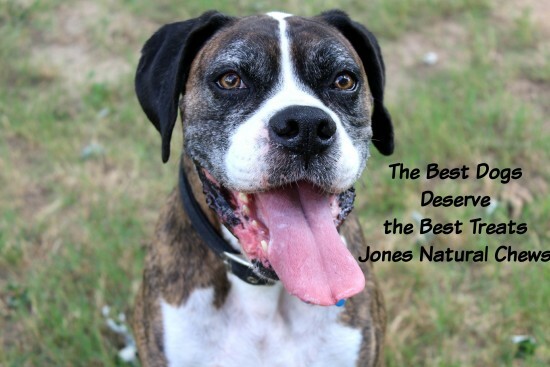 Jones Natural Chews is giving away a Bow Wow Boo Bucket to one lucky dog! And the deadline isn’t until next weekend, so that gives you time to find the very best dog AND win it some yummy treats! And like a lot of Boxers, every Jones treat is all natural and grown and produced in the USA! So click on this highlighted sentence and it’ll take you to a new link where you can comment in order to have a chance at winning the very best treats for your very best dog. You’re welcome. My work here is done.